I’ve had the relationship between creativity and exercise on my mind for a while now. From moving to one of the Top 10 fittest cities in the US, to an article that I just can’t get out of my head about famous creatives and how they spent their days. 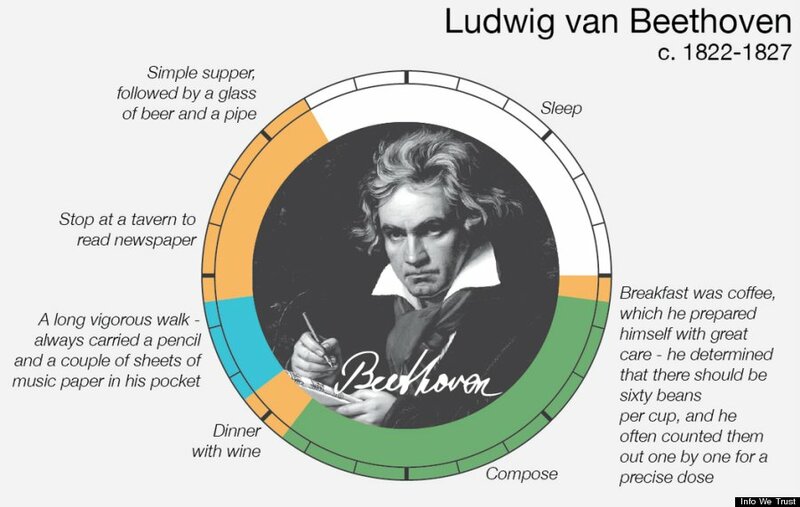 The blog Info We Trust designed some pretty fantastic visualization of that data, gleaned from Daily Rituals: How Artists Work by Mason Currey. Check out my favorites below. 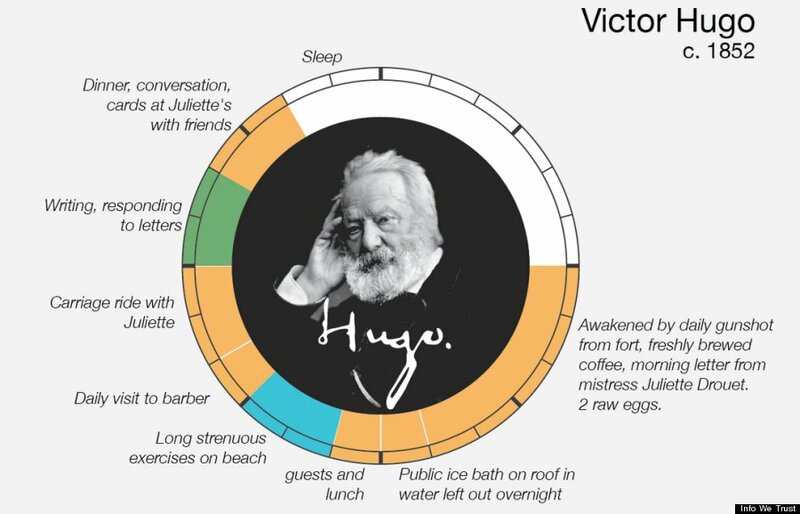 But rather than making my a personal pinwheel of productivity, mapping out my own eccentricities, I simply analyzed my “ideal work day” and explored how to go about being more productive while maintaining a certain level of activity. In addition to writing every day, I usually take morning walks and try to work out most days. During the occasional afternoon run or swim, I often come up with some of my best ideas. I once found myself sprinting home so I could write down the twist ending to MURDERED, afraid I’d forget the burst of inspiration. Yesterday, while mowing the lawn, I came up with the plot for a pretty fantastic Sci-Fi horror film (I’ll let you know if it ever makes it to the big screen…). Okay, so the relationship between exercise and creativity is long documented. So what? Well, here’s the problem with that daily segmented wheel–it’s finite. There are only so many hours in the day. But what if I could combine the act of walking and writing? The plan is to walk while writing, researching, editing, and marketing. I just purchased a walking treadmill and raised one of my desks to accommodate. I’ll start off slowly, with sitting breaks, but I’d like to get up to several miles of work by the end of it. What do you think? Am I onto something or just “spinning my wheels”? What’s your secret to productivity? ← Holy Batman Day, Batman!